Ben Mee says the Clarets will work hard during the international break to rectify the disappointment of Sunday’s defeat against Arsenal at Turf Moor. Burnley aren’t in action again until October 16th when they’ll be reunited with Jay Rodriguez and Charlie Austin as they take on Southampton at St Mary’s. 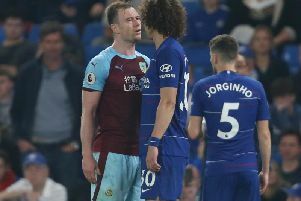 The Clarets seemed certain to take a point in a goalless draw against the Gunners but Laurent Koscielny administered the fatal blow in the final seconds of the top flight fixture. The Frenchman, in an offside position, appeared to guide the ball over the line with his hand after Alex Oxlade-Chamberlain had got a toe to Theo Walcott’s flick on. “To get beat like that was really disappointing and a real sickener,” said Mee. “We put a lot of hard work in to the game so it’s very disappointing. “There’s handball, offside maybe, but it’s one of them things and it’s for the referee to see. It’s unfortunate. The late drama denied Sean Dyche’s side a third clean sheet of the campaign but Mee feels that they’ll be plenty more to come. “We can take heart from it because we held out against a very good team for 90 minutes,” he said. “We have to (see through the disappointment). We always do and we’ll pick ourselves up.